I hope everybody had a good Easter and/or Spring Break! We got to spend it with family – and since all the kids in our family are boys, and not quite teenagers, we colored eggs, we even hid eggs, but then in the fashion you’d expect from almost-teen boys, we propped eggs in trees and shot them with BB Guns. Long ago! Sharp Top overlooking Abbott Lake. We also spent a little time in the mountains at the Peaks of Otter, outside Bedford, VA. These peaks are like my backyard. I can’t tell you how many times I’ve stood on top of Sharp Top (1,500-ft climb in 1.5 miles, beautiful 360 degree view and completely unobstructed views out to the eastern horizon). Sharp Top is where I first cut my teeth on hiking, maybe 4 years old? It was also the first mountain my sons climbed, the first place they camped out away from home, the place where they caught their first fish. A lot of great memories are tied to this place. Given the family dynamic here (4 boys, 4 parents, 2 grandparents), we didn’t have the time or disposition to climb any mountains, but we enjoyed the area just the same. First we hung out at the Peaks of Otter Picnic Area, and there had some rousing races floating water bottles down the creek over the miniature rapids and waterfalls. We also noticed lots of wildflowers, and blooming dogwoods. Spring had come to the mountains, but only up to about 2,600 feet. Above that, the trees are still bare, with just a hint of budding, and the summits look as if they’re still stuck in February. We’re told that the greenery climbs the slope at about 100 vertical feet per day, and then the color creeps down at the same rate in the fall. After at least one boy had fallen in the creek, we headed to Fallingwater Cascades. A few miles north of Peaks of Otter on the Blue Ridge Parkway, the Fallingwater Trailhead is at mile marker 83.1, at about 2,550 feet. The trail is short – advertised at only 2,000 feet (0.4 miles) to the falls, but loses about 300 feet of elevation in the process. The trail starts off fairly flat, and well-manicured, as it slabs along the western slope of Flat Top Mountain, heading generally north into a valley. Gradual slow descents are interrupted occasionally by stone steps that descend more quickly. After a quarter mile, the trail does a U-turn just before reaching the creek, then follows it a short distance to cross the creek on a nice bridge just before the top of the cascade. Looking back south through the notch formed by this small valley, you can just see Sharp Top poking out above Flat Top’s shoulder. The plunge is correctly labelled as a “cascade”. The creek doesn’t fall in one single free-falling plunge, but tumbles down a series of steep slides and short falls for about 100 feet. The trail nears the creek at several points along this journey, offering several nice viewpoints before steeply descending the last drop to the bottom of the falls. Flow rate and volume of course depend heavily on the weather – I’ve seen this cascade as a torrent, and I’ve seen it as a trickle. But for 0.4 miles it’s worth the journey to investigate, regardless! Unfortunately, it started to rain on us just as we started down the last drop to the bottom, so the group elected to turn back before the gentle rain became a deluge (fortunately it never did). Still, a great time with family, gorgeous scenery, and the serenity of a mountain stream. 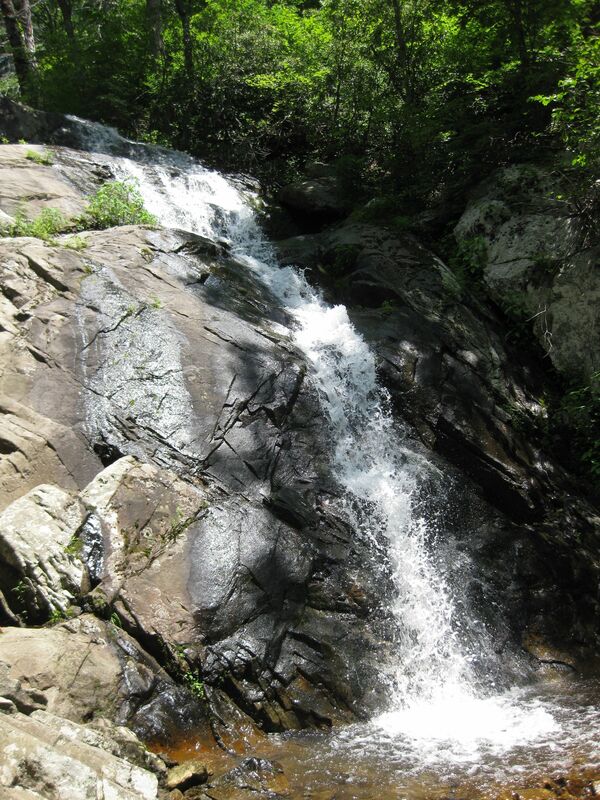 Makes a great, quick, stop along the Blue Ridge Parkway – I hope you have the opportunity to check it out! Note: If you’re adventurous, this trail continues below the falls, cuts back south across the valley and then climbs to join the Flat Top Mountain Trail just west of the Blue Ridge Parkway. From here you can go left and close the loop back to the Fallingwater lot, or you can continue across the Parkway to the Flat Top Trail parking area and thence up and over Flat Top Mountain, on a 4.5 mile trail that will end back at the Peaks of Otter Picnic Ground. The Fallingwater loop itself is 1.75 miles long.